Earlier this week, we ran a story about a state grant Kitsap County Parks and Recreation hopes to get for some of the work on a planned state-of-the art outdoor skateboard facility at South Kitsap Regional Park. Formal plans call for a BMX bike track adjacent but not connected to the skatepark. 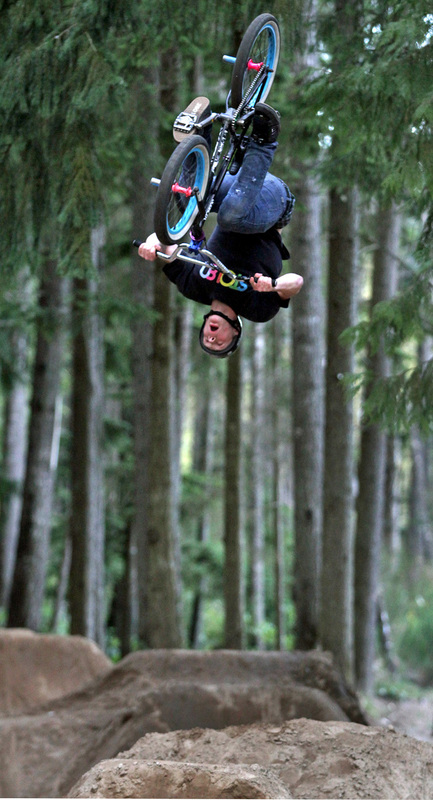 But informally, BMX riders have for decades been enjoying their sport on a warren of trails with do-it-yourself jumps in the wooded part of the 200-acre park. According to 32-year-old Chris Marin of Port Orchard, default spokesman for the loosely affiliated BXM community in South Kitsap, the group is self-policing. Older riders and parents step in to dismantle jumps that show just a little too much industry. The unspoken rule is that jumps must be passable for younger riders and others who may not wish to defy gravity. A circular race track built in the early 1980s was removed some years ago. The course is well-used, Marin said. On any given weekday, 30 to 50 riders trickle through. On weekends, 60 to 80 riders is typical, he estimates. Most are teenage guys, but some are older. 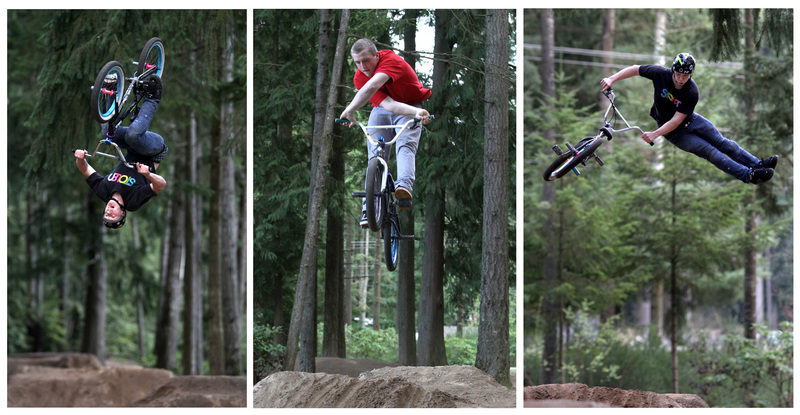 Marin said he’d like to see more girls out there riding the jumps. “There was some concern there would be major injuries if the jump building continues,” Dunwiddie said. The county is holding back for now on harsh enforcement. They gave the riders time to remedy the situation. Marin orchestrated removal of the water heater, and a couple of weeks ago, when Dunwiddie went out with the official who evaluates the county’s liability, the offending jumps had been removed or lowered. Dunwiddie passed out his business cards to a few riders who were there and invited them to spread the word that he’s looking for others, beside Marin, who might take on more formal stewardship of the area. As of Monday, he had not heard from anyone. Marin said publicity over the water heater helped, in that a few parents and other adults have stepped up offering to help keep the track safe and clean. As for plans for a more formal track closer to the road, Marin said, more or less, if it’s not broken, don’t fix it. Unlike the South Kitsap Skatepark Association, which has raised more than $100,000 toward a public skatepark, BMX’ers can operate on a shoestring, Marin said. He believes BMX’ers would be perfectly content to continue as they have for an estimated four decades. Marin would like to see the county give permission for the race track to be rebuilt. Those who installed it even ran water and power out to the area, so he believes it could be done for minimal expense. Anyone with an interest in the BMX track at South Kitsap Regional park can call Dunwiddie at (360) 337-5350 or volunteer/stewardship coordinator Lori Raymaker at (360) 337-5372 or parks superintendent Dori Leckner at (360) 337-5362.